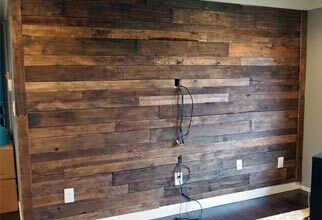 Decorating an entire wall with pallet wood just seems so cool. As an accent wall, you really can’t get any cheaper or more versatile than a pallet wall. Once attached to the wall, the pallet boards let you hang anything, anywhere on the wall! So much easier for future decorating. This has been on my to-do list since first getting my hands on a pallet. What’s your favorite pallet wall style? Do you have a pallet wall in your house?! Please share it down in the comments. 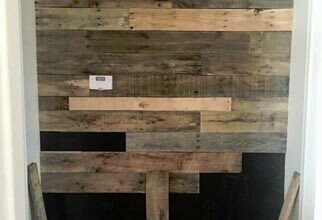 This is the perfect accent wall using pallet wood. The sides are capped with a vertical board so you don’t even have to worry about getting them flush. Once you mark for your studs and get your saw and nail gun ready, you’re probably only an hour or two from a pallet wall. I’ve actually seen this versiona bunch of times the past few months. I keep coming back to it for a few reasons: She styled the small end wall in her hallway beautifully with pallet wood. She also used construction adhesive to attach the boards, with brad nails just being used to hold them in place until the glue dried. That’s super easy! And lastly, she didn’t have to break down pallets because she had disassembled pallets shipped to her house! 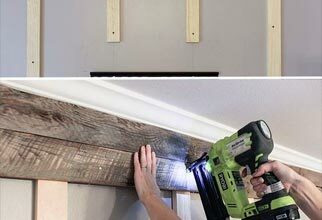 This method of attaching pallet boards to a wall really intrigues me. It’s kind of brilliant. By attaching what are essentially furring strips to the studs of the wall first, you reduce the number of holes in the original wall. 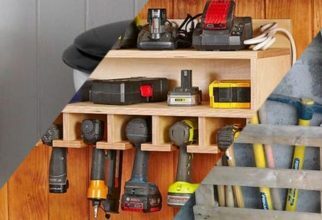 By driving all the nails into the new structure, your pallet wall is simple to attach and wouldn’t require much patching if you ever change your mind and take it down. OMG, yes! Everything about this image (see the full size at the link below) is incredible. This tiny room now has the most expansive feel in their whole house! 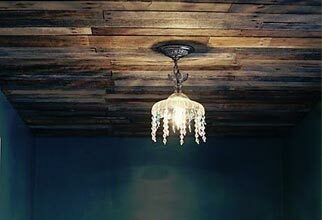 The color of the walls, the texture of the pallet wood, and the lovely chandelier make this room speak to my soul. 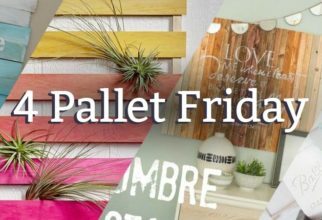 Have you tried any of these pallet wall projects? 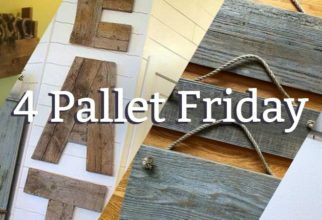 Do you have any pictures or pins that you’d like to see featured in our next 4 Pallet Friday? Let us know in the comments below or on social media with the hashtag: #4PalletFriday.